I teach in a school which is completely comprised of multiage classrooms. This comes with its challenges, of course, but with a different perspective, many of those challenges turn themselves into benefits! The latest chapter of Math Work Stations was very helpful, as it described how to set up stations and how to start using them. Debbie Diller had so many examples of mini-lessons and actual conversations teachers can start with students to explain expectations and how the stations work. This is SUCH a great resource! Here are my answers to the Guided Questions for this chapter! 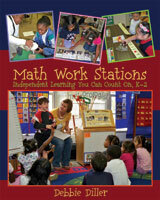 What should your math work stations look like, sound like, and feel like? This reminds me of the Daily Five framework, where you make anchor charts with students so that they know your expectations for that period of time. I definitely agree with the examples that the book showed. Students should be working the whole time, taking turns, speaking quietly with their partners (about math! ), and using appropriate math vocabulary. I think making an anchor chart to remind the students is a great idea - it gives them ownership of the whole situation! What does your management board look like? Although I am so tempted to purchase Debbie Diller's pocket chart ASAP, I really need to be saving my money... I did see a teacher who implemented her literacy stations, and that teacher created a setup similar to the Really Good Stuff pocket chart, but on her bulletin board. It worked out really well. She used student pictures, and they LOVED that, so I think I will do that next year, too! How do you support math vocabulary (math talk cards) in your stations? I am planning on implementing Academic Vocabulary in my classroom next year, so this really goes hand-in-hand with that. When I was teaching 5th-8th grade math for six weeks at my school during this past school year, I had students in every section who struggled with what I saw as basic math vocabulary when they were solving word problems. It worried me, so I want to give my students a solid foundation by exposing them to the vocabulary in 1st and 2nd grades. Anyway, I'd be sure to bring up applicable math vocabulary during our Academic Vocab time in the morning, and then we could definitely make the math talk cards as a class to put inside the tubs. I loved her idea of the conversation bubble - how cute! And it makes the math talk cards stand out. Check out Mrs. Parker's blog to see other teachers' reflections and ideas about Chapter 3! Thanks for sharing your thoughts on Chapter 3. I love the Rotation Station chart. I would love to know more; especially the color coded system on the left. As I read this chapter, I felt that I could do this. I think thoughtful planning is key. I know it seems a bit overwhelming at first, but she (Debbie) has a way of making it obtainable. I am glad we are all going through this together! Love the picture of your bulletin board! I am new follower. Love the blog design! Looking forward to following! High Five Kim from TBA! I am a third year teacher (yay!! ), and I'm teaching a first/second grade multiage class! I love to make content come alive for students through hands-on, experiential learning activites. I also LOVE to incorporate literature and do so whenever possible! Always Running: La Vida Loca: Gang Days in L.A.
Share book reviews and ratings with Jill, and even join a book club on Goodreads.